After a brief hiatus, Madison is back to share her veteran Disney World knowledge as only a 10 year old can. Hi, I'm back. After all of the recent talk about the Disney Dining Plan, I thought it would be a great time for me to share with you my experience with the best part of the meal - DESSERT. This week I'm going to tell you the Top Three Desserts at Disney World according to me, so listen well. The first dessert is from Tony's Town Square in the Magic Kingdom. My favorite is the Tiramisu. It is awesome. I would always make my Dad order this as his dessert and then I would switch with him so that I could eat it. This dessert is why I always look forward to eating at Tony's Town Square each trip. If you are not a fan of Tiramisu (but how can you not be), I would suggest the Chef's Signature Cheesecake or the Ice Cream Bomb. We travel to Epcot to find the next dessert in my list of the Top Three. We travel clear to Canada in the World Showcase. Here at Le Cellier is the Chocolate "Moose". When I ordered this, I thought I was getting some kind of pudding. As it turns out, I still think it was, but it was in the shape of a "Moose" and it was sticking it's tongue out at me. How fun is that? A dessert that tastes incredibly chocolaty and looks like a Moose too! The final dessert is.....drum roll please....found at the Polynesian Resort at a place called 'Ohana. The last dessert is called the 'Ohana Bread Pudding served ala mode with Bananas and Caramel Sauce. 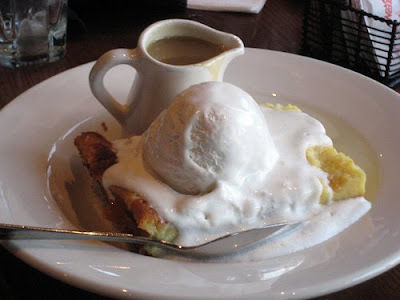 You share this dessert with your family, so don't go to the bathroom when the dessert is about to arrive because when you come back there won't be any left. It is really that good. So don't forget when you are picking the restaurants that you are going to eat at during you next Disney World trip to check out the dessert menu ahead of time. These Top Three Desserts are good enough to keep these three restaurants at the top of my "Must Visit" list. Well that's my Kid's Eye View for now. See you next time! 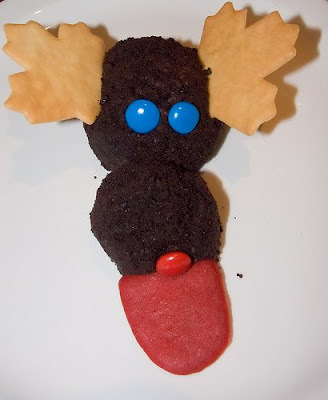 2 comments to "Kid's Eye View - The Best Of The Disney World Desserts"
Can't wait...I may try the "moose" this year. I've never had a dessert which stuck its' tongue out at me --- may be fun! !